"I am not attracted to straight angles or to the straight line, hard or inflexible, created by man. I am attracted to free-flowing, sensual curves that I find in the mountains of my country [Brazil], in the sinuousness of its rivers, in the waves of the ocean, and on the body of the beloved woman". After this quote you can appreciate the great Oscar Niemeyer's designs, and in this case, the homes he designed. This is one of the few occasions that Mr. Niemeyer's residences have been featured in a book, his homes also having been overlooked by critics and others. This modernist Brazilian master designer made homes of many different mediums, for a diverse clientele. Having studied under Le Corbusier in France, Niemeyer not only designed houses in his native Brazil, but his work was in demand around the world. Personally, I wasn't enamoured with most of his houses but I would imagine, at the time, they probably were way avant garde. I did rather like the openness of the room on page 93 and I also liked the blue fireplace on page 106. 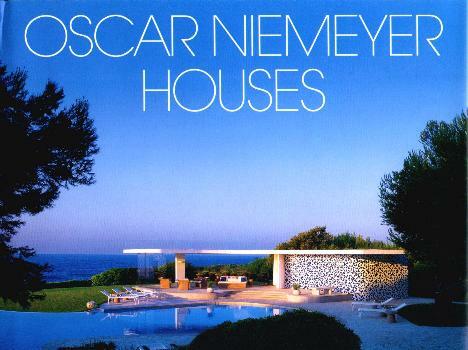 My two favorite Oscar Niemeyer houses, of the ones featured in this book, are the Strick house (Santa Monica, California) on page 130, and the Mondadori house (Cap Ferrat, France) on page 140. Conclusion - A lovely look at how some people live.